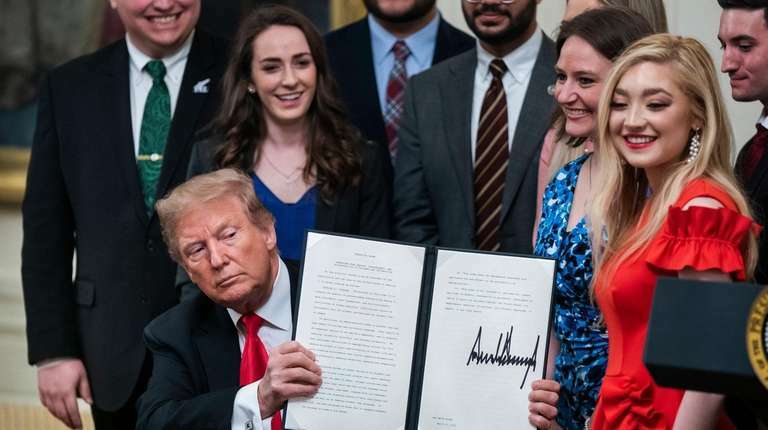 Joined by students who complained of having their conservative and religious messages suppressed on campus, President Donald Trump signed an executive order underscoring First Amendment rights and free inquiry at public universities that expect to receive federal grants. Trump also spoke Thursday at the White House of steps to "promote transparency for students at private schools" that go by their own freedom codes. Trump first proposed the move in a March 2 speech to right-wing activists. Newsday's Laura Figueroa Hernandez describes the signing here. A key question about the signing concerns practical impact. Schools already are supposed to abide by this. The edict orders 12 federal agencies that fund university research to add language to existing agreements that institutions sign for the funds. As for his history with the First Amendment: Trump has hinted of an FCC probe of "Saturday Night Live," which ridicules him, and of strengthening libel laws, and he pushes the notion of news media as "enemies of the people." It is hard to say what practical impact any of that has had either. Another consideration is the reach of federal regulation. Even Education Secretary Betsy DeVos has said she doesn’t believe “government muscle” should be used to address campus free-speech issues. “A solution won’t come from defunding an institution of learning,” she said last fall. Professed Trump enthusiast Cesar Sayoc pleaded guilty in federal court to charges linked to explosive packages mailed to former President Barack Obama and other prominent Democrats, Newsday's John Riley reports. U.S. District Judge Jed Rakoff in Manhattan said advisory federal guidelines call for life in prison. Sentencing was set for Sept. 12. Three weeks before Israeli Prime Minister Benjamin Netanyahu faces an election, Trump tweeted "it is time" for the U.S. to "fully recognize Israel's sovereignty" over the Golan Heights, first captured from Syria in 1967 and annexed by Israel in 1981. Netanyahu, who is due to visit the White House soon, thanked his ally Trump in a tweet of his own. He's been pushing for the U.S. recognition. The impact of Trump's statement, if any, and details related to it have yet to be seen. "This recognition will be great news for our ally and its right to self-defense," declared Sen. Ted Cruz (R-Texas). The centrist Atlantic Council's Frederic Hof, however, warned that the only parties standing to gain from the gesture are Iran, Syrian President Bashar Assad and the Islamist Hezbollah Party. This is Hof's argument. The House Oversight Committee said Thursday it has evidence that Jared Kushner and Ivanka Trump used personal email accounts and messaging apps in their role as presidential aides. This may violate laws that apply to White House records, along with ironically echoing the storm over ex-Secretary of State Hillary Clinton's use of a private server. Committee Chairman Elijah Cummings said the couple's attorney, Abbe Lowell, informed the panel in December of the private email and WhatsApp usage. The nine-page Cummings letter to the White House requesting documents, dated Thursday, is linked here. Extended public snits by Trump over the late Sen. John McCain and surrogate Kellyanne Conway's spouse George seem to follow no strategic purpose, Politico writes. Trump complained again about the Federal Reserve Bank. The Interior Department violated the law by failing to account for the climate impact of its oil-and-gas leasing out west, a federal judge ruled. Facebook knew of Cambridge Analytica’s “improper data-gathering practices” earlier than previously reported, according to a court filing by the attorney general for Washington, D.C., cited by The Guardian. Vice President Mike Pence is trying to drum up financial support for the Trump 2020 ticket by appealing to Republicans who didn't back the pair in 2016.